I love browsing at the grocery store. I know, I know, it’s weird. I hear people say often they dread grocery shopping. I actually look forward to going to the store alone, pushing my cart around, checking out all of the things I’ve never tried, seeing what produce looks great, what’s on sale. It’s my happy place, a store packed full of food with so many possibilities, so much goodness just waiting to be created in those aisles! While at Nature’s Pantry recently, I spotted date syrup from The Date Lady. I’m a big fan of anything made with dates so of course I bought it. While waiting in the check-out line, I noticed it was made just down the road a few hours in Springfield, Missouri! I’m excited about a local product that’s full of all sorts of goodness and contains none of the not-so-goodness. I’m even more excited to share it with you! So what’s one do with date syrup? Well, about a million things. My favorite is as a topping for waffles, it’s better than any syrup I’ve ever had. And The Date Lady caramel sauce is the most decadent ice cream topping I’ve ever had. If you told me there was a way to make caramel sauce dairy-free and more flavorful than the “regular” sauce, I would not have believed you. Then I tried The Date Lady’s caramel sauce. Unbelievably rich, yet it contains no ingredients that I worry about eating. Just good stuff here, folks. Surely it’s no surprise I decided to bake with the date syrup, to use that amazing caramel sauce in a dessert. AND thanks to the kind folks at The Date Lady, you can enter my giveaway so you can bake these at home! Or top your waffles or ice cream or eat it on a spoon from the jar. Yep, I did that. You’ll find the entry information at the bottom of the post. The winner will receive a jar each of the date syrup AND the caramel sauce! I baked up chocolate cupcakes, except they are just dense enough to be a muffin, a really sweet muffin. Cupcake + muffin = cuppin. Then I frosted them with a classic American buttercream with a hint of caramel. These are definitely more cupcake than muffin when frosted, but unfrosted you might be able to pass it off as a muffin. These are great either way! In bowl of stand mixer, cream Earth Balance until fluffy. One cup at a time, add in sifted powdered sugar. Mix until each cup is incorporated before adding another. Once the sugar is well combined with the Earth Balance, add the Caramel Sauce. Turn mixer onto high and let it mix for about 5 minutes. Frosting will be fluffy. Top cupcakes using your preferred method. I use a piping bag and large tip, but this frosting works just as well with the traditional knife frosting technique. You can win goodies from The Date Lady! 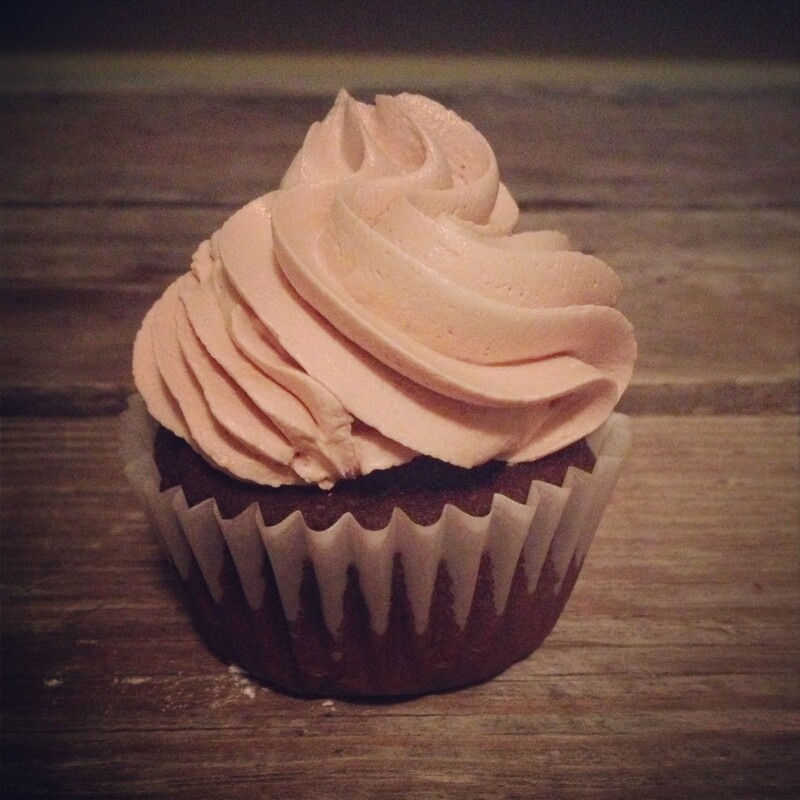 Make your own Chocolate Cuppins with Caramel Buttercream Frosting! 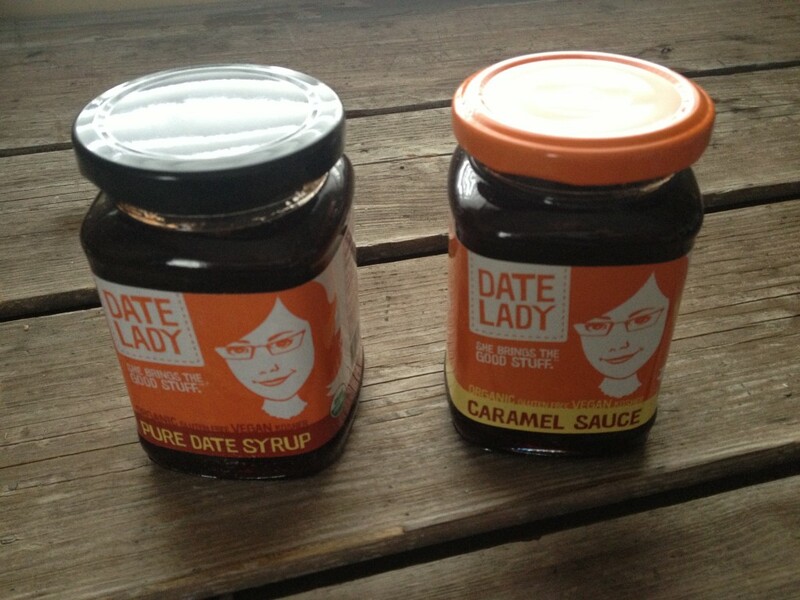 The Date Lady will send the winner one jar each of her delectable date syrup and the decadent caramel sauce. Just enter below, lots of ways to earn more entries and increase your chances of winning! Disclosure: The Date Lady provided date syrup and caramel sauce for use in developing the above recipe. The opinions expressed are my own. I like coconut nectar, too! I think this would be a great topping on breakfast dishes, it’s sure at home on waffles here! Hmmm…I’m wondering if It will work to make coconut milk whipped cream and add the caramel sauce for caramel whipped cream. Wow–How have I never seen this here!?! I will have to check for it at Mamma Jeans! Yummmmm – love dates and carmel and what a wonderful combination this would make. Have been making snack treat bars and this would be a wonderful addition. It is a great combination! I think of refined sugar and dairy when I think of caramel, so this is a particularly great treat for me! It help to include something really yummy to go along with all the vegetables and other healthy items. I would love to try these. Thank you for the opportunity to try. I agree! A delectable treat in moderation is a great way for me to stay on track with healthy eating! Both the date syrup and the caramel sauce are great on chocolate cake. I hope you’ll give them a try! This sounds like another great natural sweetner option I could use in cookies or brownies! I’ll be looking for this product in the stores. I agree, it’s a great natural sweetener alternative. So far in my experiments, I’ve found I can use about 1/2 the date syrup of the sugar in a recipe. I’ve had good luck so far! We are big fans of dates in our homemade oatmeal (literally almost every morning). Lately we have found an amazing gluten free waffle recipe and the date syrup would probably make it crazy good!! oh heck yes, johnna! these look so awesome! 1) how had i not already liked your facebook page?! 2) there’s not telling what i’ll make… the possibilities are endless lol. maybe a cake with caramel sauce? I love ice cream so I would definitely try these as a topping on that! It’s a great ice cream topping! I would love to make clean brownies w this. Love using dates in protein balls. Oh my goodness, I love bread pudding! I think the caramel sauce would be a divine topping on bread pudding! i’d make my fiance some kind of healthy chocolate caramel bars! Both of those sound terrific to me!